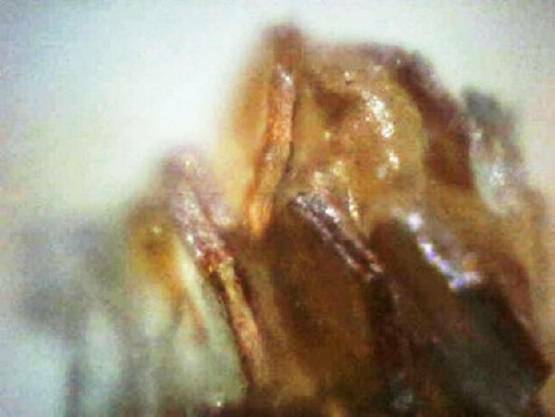 Complete horror was experienced by one lady with Morgellons disease. She had phoned me and told me her story as it was happening. For a time was she was reluctant to ever let anyone else know this had happened to her. She has now kindly allowed me to show her photos and tell her story. She is a brave lady and I trust her story completely. She has sent me some of her specimens to study. She wishes to remain anonymous but did want people to know what bizarre and suspicious kinds of material Morgellons disease can produce. A second lady has also spoken to me about the same manifestation of hexagons in her skin. It is certainly time to help the public realize that this is not some insect or zoonotic (animal to human ) based disease. This Lady knew that something was happening to her leg. 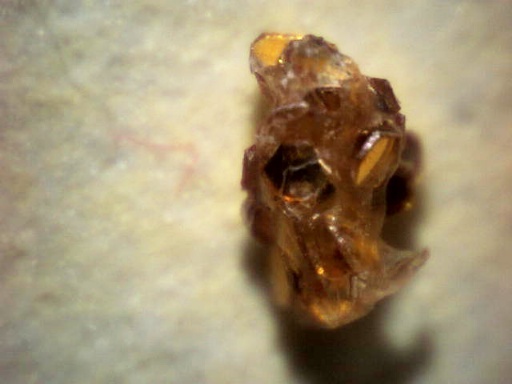 She could feel something in it and took a closer look with her digital microscope. What she observed was like being the main character in a horror movie. 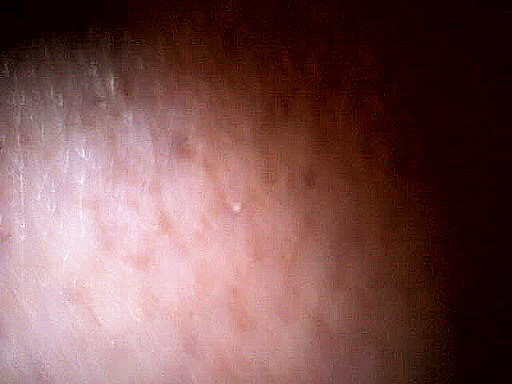 She saw that the texture of her skin had changed and it reminded her of snakeskin. The normal skin was replaced by a hexagonal pattern. 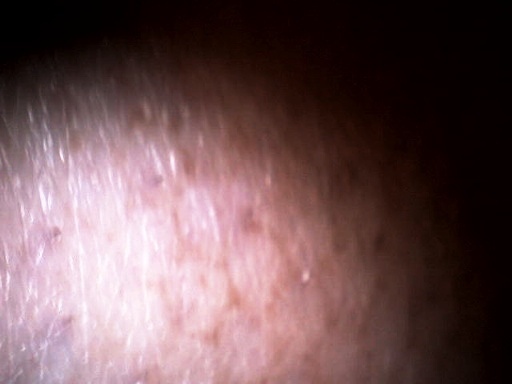 Here are two photos of what she saw on the calf of her leg 10x magnification. The effected area was less than 2" in diameter. She wanted to remove this patch of skin in any way possible. It was not a large patch so she tried many kind of treatments on her skin. She preferred not to go into details about the removal process since she was taking extreme measures to make it abate. The resulting hexagon and attached tissue in the photo below was able to be removed in tact at that time. 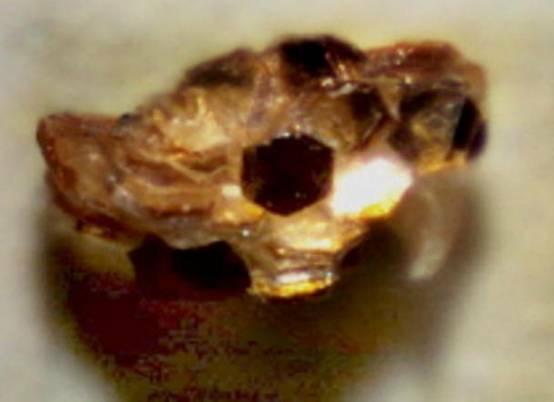 Later other clumps containing more glued-together hexagons were also photographed as she removed them from her leg. She did eventually remove this scourge from her skin and this manifestation has not reappeared. The question about this manifestation is what was the purpose of it? It did appear to be something with a deliberate purpose. Perhaps it is better this lady never had to find out. All I can say is if anyone thinks that Morgellons disease is about "bugs" they are missing some very important implications and being lead in the wrong direction. As surreal as this all seems, it is grim a reality to many of us who have to live with Morgellons disease. I hope the public will wake up soon and help us. This is a highly technical and futuristic lab-created disease. 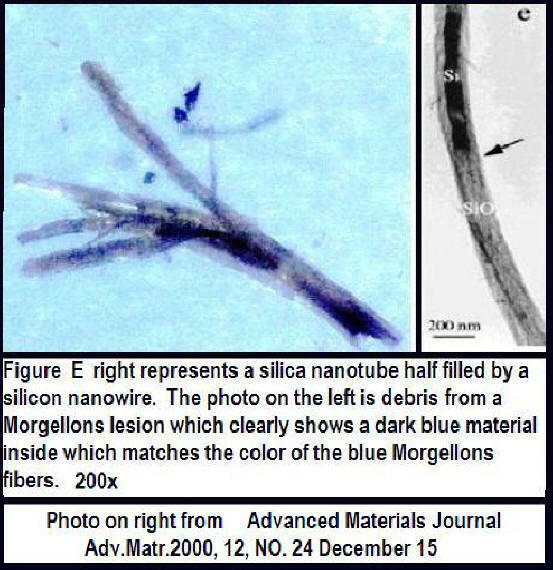 I have to wonder how much of a coincidence it is that yet another related nano formation has come from a Morgellons lesion. I have identified four nano devices and of the four I have found three of them in the same pages of the Wiley InterScience Journal. They publish original research on biomaterials used in research, medicine and communications. Three nano items from a single article is more than a coincidence. 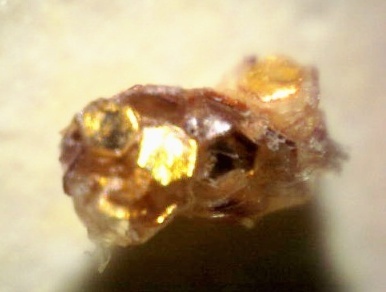 The Advanced Materials page can be found in it's entirety here and is listed under heading, Advanced Materials, Communications.http://www.morgellonsexposed.com/Misc/00_AM_2%5B1%5D.pdf See figure 2 letter "e"
There has been much disagreement in the Morgellons community about what this disease really is. Some people use the word "body bugs". That is a particularly repugnant and derogatory term for what we really have. This misleading term points to some occurrence of nature acting upon a likely target. The image that term coveys lends itself to visions of being in unsanitary conditions or people who have in some way attracted these horrific infestations upon themselves by their own lack of hygiene or good judgment. That is NOT the case. I have had Morgellons for 13 years and as terrible as it has been I cannot even imagine how unbearable it would be to have an insect-like infestation on top of that. My heart goes out to those people who experience this and hope that no one will ever think of them as people with "body bugs". The people who use the term "body bugs" are usually those who prey on the Morgellons sufferers with overpriced snake oil to peddle. The public empathy and support for people with "body bugs" is zero. Pure revulsion can be the only result of that kind of characterization. Why don't we all hang a tag around our necks saying "I'm creepy and infested with body bugs, run away". If someone is calling Morgellons " body bugs" they are hindering the truth from being heard and are no friend to people in the Morgellon's community. It is true that there are insect-like manifestations for many people but what is it that we are really viewing? The probability is that all of Morgellons comes directly from a bio or nano lab. The exception to this may be a secondary infestation of tiny insects who are primarily eaters of decomposing cellulose. My previous research show the presence of dictyostelium discoidium ( cellular slime mold) as a component the morgellons lesions. The cellulose residue of this slime mold may be an attractant to some tiny insects but even that is doubtful due to the extreme difficulty people have in getting rid of them. 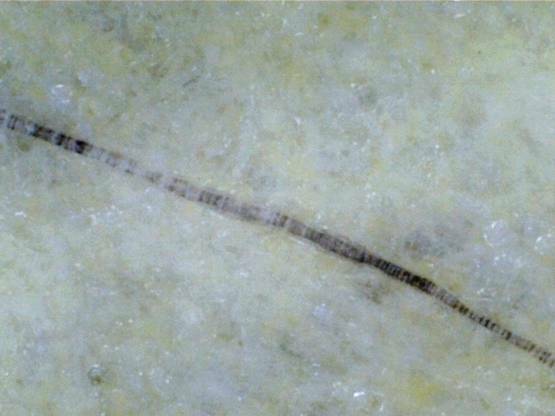 The variations in Morgellons disease are put in place as a means to create confusion. Just as chemtrails are sprayed in the sky over every part of this country and others countries as well. So are the variations that have been used in the chemtrail pathogens. Confusion of the issue is a key component in keeping Morgellons sufferers bickering amongst each other within their own community and forming little unproductive factions of people who disagree about what Morgellons is. This is so sad because the disease is variable in it's manifestation and their are no winners no matter how the individual symptoms manifest or why. A divided community is not productive. Although no official statistics are being collected there is a general consensus that a disproportionately large number of Morgellons sufferers have these characteristics compared to normal statistical data. These are the 6 known genetic markers identified in Morgellons victims which are disproportionate with the known statistics. The severity of the symptoms may relate directly to the number of markers each person has. 3. A genetic Haplogroup of U5 Ursula, U5 is the most ancient DNA in Europe (50,000 years to 60,500). The red and blue and clear Morgellons fibers are in everyone. I believe these are the core materials specialized as DNA and RNA mutating mechanisms. The population of people with insect-like manifestations as well as the fibers are just the very unlucky people who got targeted with an additional nightmare on top of the other pathogens all ready in place. Bio-insect vectors may be in chemtrails or the release of actual hatched bio-insects may been another vector. It seems likely that if a microscopic chemtrail vector is used then bio-engineered insects can hatch either in people or in nature and then infect people. These bio-insects are extremely resilient and difficult to kill. Bio-insects makes me think of the "Terminator" in the degree of difficulty it needs kill them. Their incomprehensible resilience is factored into their design. It occurs to me that the technology in may aspects of Morgellons is so advanced that it has made the disease difficult for the public and even some of the families of sufferers to believe. Many marriages have been torn apart by spouses that are unable to grasp the true reality of the situation. Many would prefer that their partner is really delusional than to believe this awful truth about what is happening. If I had not been observing this disease for 13 years myself I would probably have my doubts too. The fact of the matter is it is happing and is real. After studying Morgellons disease all of these years I have seen many things that current science does not explain. Then again the government is always decades ahead of the public in technology. I do wonder what the origins of this technology are. Although the source seems to be our own government I do ponder what covert deals have been made with entities unknown to have the capabilities of manifesting this sci-fi horror technology. Take a good look at what people have found on themselves and then try to convince yourself that Mother Nature made these. There are many kinds of bio-insects beyond the ones shown below. They are diverse and many look much like insects from nature. 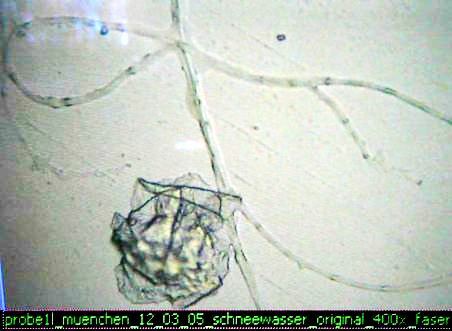 This microscopic picture of chemtrail fiber egg strands was taken by two researchers. 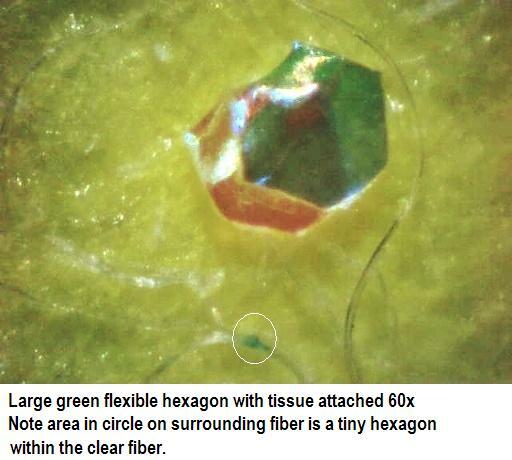 Note blue Morgellons type fiber in ball cluster. 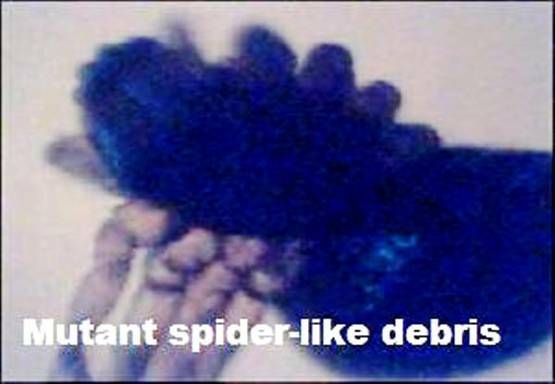 The color of this Bio-Insect matches the blue Morgellons Fibers found on Morgellons Sufferers. 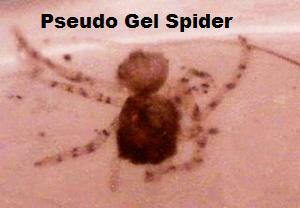 The legs and body of this Bio-Insect are made of gel. This specimen is from a Morgellons sufferer. This Bio-worm was moving when I found it. In reality after lab testing these formations are made of polysaccharides (aka-Sugar Snake) although I think that DNA testing would reveal a nematode gene in them as well. Fortunately for the EVILDOERS this community has no financial support or solidarity and very few specimens ever get to a lab. Those that do are very telling but are quickly brushed off and discounted. It is pretty darn discouraging to keep singing to the crowd when nobody is really listening. Much of the public does not want to believe any of this. If they had to accept this reality that is shared by me and thousands of others, it would change the very nature of their own realities into something unthinkably ominous. Not only is the government not going to help us, they are not going to stop causing this. Lab made crap is falling out of the skies, being fed to us, injected into us and probably in the fabrics we wear. I believe that it is in everyone but many may not have a body that rejects it. That is known as assimilating which I believe was the original intent of all of this weird science. I do not belive that it was intentional to cause a segment of the population have the adverse reaction now known as Morgellons. I think someone made a big mistake causing this to happen. The bio-insect vector may have been an after thought to hide the mistake. Think of Morgellons victims as the unintended messengers. The Canaries in the Transhuman Coal Mine warning you about what is really happening.